ISLAMABAD: Farhan Zaman and Ahsan Ayaz defeated their fellow Pakistani opponents to qualify for the quarter-finals of Pakistan Open Men’s Squash Championship here at the Mushaf Squash Complex here on Tuesday. But it was a disappointing day for the home country as Kashif Asif, Asim Khan, Farhan Mehboob and Shahjahan Khan all failed to make it to the last-eight phase of the competition after suffering defeats in their opening main-round fixtures. Farhan dropped the second game before defeating Waqar Mehboob 11-5, 8-11, 11-9, 11-5 in 32 minutes, while Ayaz sealed a 11-9, 11-4, 11-9 victory over Mohammad Shoaib Hasan 11-9, 11-4 and 11-9 in a 27-minute encounter. Kashif lost to Malaysia’s Mohd Syafiq Kamal 8-11, 8-11, 7-11 in 31 minutes; Asim extended Yip Tsz-fung of Hong Kong to four games in 50-minute battle before losing 6-11, 6-11, 11-6, 8-11. Shahjahan twice drew levelled with Shehab Essam after losing the first and third games before the Egyptian prevailed in the fifth game to reach the quarter-finals after a tense 58-minute struggle. Essam won 11-5, 3-11, 11-6, 2-11, 11-2. Eassam’s compatriot Mazen Gamal, meanwhile, needed only 27 minutes to beat Farhan 11-7, 11-8, 11-4. There was more bad news for Pakistan at the start of the main round of the CAS Women’s International as their solitary representative Sadia Gul in the 16-player draw was beaten quite easily by Egyptian Mayar Hany 11-4, 11-5, 11-7 in only 20 minutes. Earlier, opening ceremony of the main round of Pakistan Open was held in which Air Marshal Shahid Akhtar Alvi, senior vice-president of Pakistan Squash Federation, was the chief guest. High-ranking PAF officers were also present on the occasion. 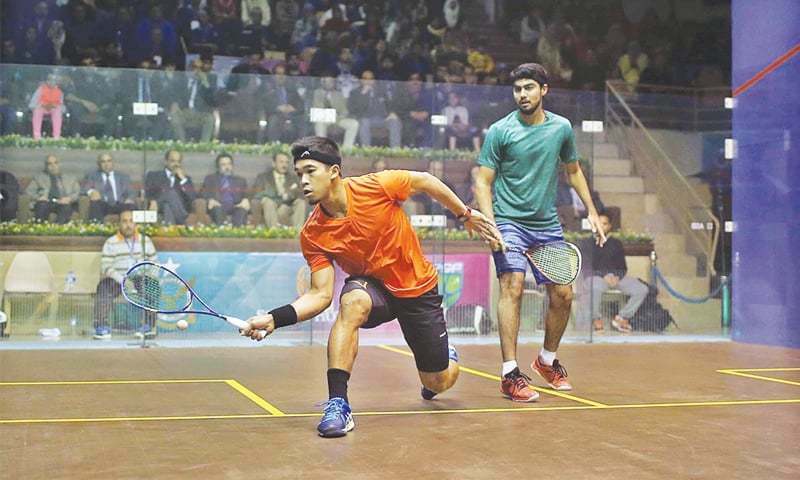 Renowned showbiz artists have joined hands with the PSF in bringing back the international squash to the country and their recorded messages were also aired during the match between Pakistan’s Israr Ahmed and Nafizwan Adnan of Malaysia, which the latter won 11-7, 11-9, 11-7 in 35 minutes. 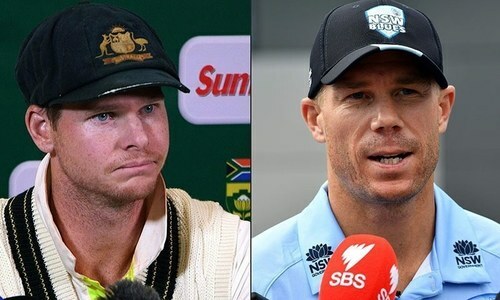 The quarter-finals of both championships will be played on Wednesday. Nafizwan Adnan (Malaysia) bt Israr Ahmad (Pakistan) 11-7, 11-9, 11-7; Marwan El Shorbagy (Egypt) bt Chi Him Wong (Hong Kong) 11-5, 11-7, 11-7; Mohd Syafiq Kamal (Malaysia) bt Kashif Asif (Pakistan) 11-8, 11-8, 11-7; Farhan Zaman (Pakistan) bt Waqar Mehboob (Pakistan) 11-5, 8-11, 11-9, 11-5; Mazen Hesham (Egypt) bt Baptiste Masotti (France) 11-4, 11-5, 11-5; Yip Tsz-fung (Hong Kong) bt Asim Khan (Pakistan) 11-6, 11-6, 6-11, 11-8; Eain Yow Ng (Malaysia) bt Faraz Khan (US) 11-6, 11-3, 11-2; Ahsan Ayaz (Pakistan) bt Mohammad Shoaib Hasan (Pakistan) 11-9, 11-4, 11-9; Zahed Mohamed (Egy) bt Rui Soares (Portugal) 11-9, 11-5, 11-9; Leo Au (Hong Kong) bt Edmon Lopez (Spain) 11-5, 11-6, 11-4; Shehab Essam (Egypt) bt Shahjahan Khan (Pakistan) 11-5, 3-11, 11-6, 2-11, 11-2; Mazen Gamal (Egypt) bt Farhan Mehboob (Pakistan) 11-7, 11-8, 11-4; Max Lee (Hong Kong) bt Adeen Idrakie (Malaysia) 11-5, 11-4, 11-3; Peter Creed (Wales) bt Zeeshan Khan (Pakistan) 11-4, 11-2, 11-3; Mohamed Abouelghar (Egypt) bt Auguste Dussourd (France) 11-2, 11-5, 11-2. First round: Ainie Au (Hong Kong) bt Rachel Arnold (Malaysia) 11-4 — Arnold retired; Hana Moataz (Egypt) bt Sarah Cardwell (Australia) 11-8, 11-8, 11-7; Rowan Elaraby (Egypt) bt Nouran El-Torky (Egypt) 11-7, 11-8, 12-10; Mayar Hany (Egypt) bt Sadia Gul (Pakistan) 11-4, 11-5, 11-7; Nadine Shahin (Egypt) bt Hana Ramadan (Egypt) 9-11, 11-7, 11-9, 11-8; Rachael Gringham (Australia) bt Tong Tsz Wing (Hong Kong) 11-6, 11-8, 11-2; Sivasangari Subramaniam (Malaysia) Nada Abbas (Egypt) 6-11, 6-11, 11-5, 11-6, 13-11; Hania El Hammamy (Egypt) bt Enora Villard (France) 14-12, 11-5, 15-13.